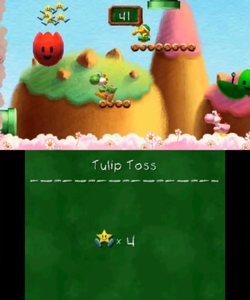 Tulip Toss is a two-player minigame in Yoshi's New Island. The objective of the minigame is to toss as many Koopa Troopas into the tulips to get stars in one minute. A Yoshi starts the minigame in a grassy area with four pipes nearby, each spawning a Koopa Troopa at a random interval. The player who gets the most points at the end is the winner, with each star counting as ten points. The tulips change color when a Koopa is thrown into them, and the color change follows this pattern: green, yellow, red. This page was last edited on May 28, 2018, at 10:13.